“Ouch! Ouch!” Obelix yelped as Dogmatix nipped his toe. The little man led the large man to one of the huts. They knocked at the door once. They knocked again. But no one opened. Then the huge giant swung his arm. The door burst open with a crash. Inside sat an old man in a corner and a pretty young woman in another corner the eyes of each glued into a little box they held in their hands. He backed away and tried to look into old Geriatrix’s box. The man gave him a wink. “Psst! See here. Nice, isn’t it?” Obelix peered into see pictures of winsome lasses displayed on the box. “Hush. She will hear.” He proceeded to intently leer into the box. As they walked towards the druid’s hut, they noticed Fulliautomatix on the way. Various brand new tools lay around him. He was intently tapping on the little box. Asterix hailed him. “Can’t you see I am busy, Asterix? I need to complete writing about the features of the latest bellow and anvil I have received for product review,” he growled. As they approached the tree from where the singing was emanating, they noticed the bard holding one of the small boxes in reverse pointed towards himself as he sang. To Asterix’s dismay, suddenly Obelix gave a whoop and picked up one of the little boxes still remaining in the crate and began to click pictures of himself and Dogmatix in different places and poses making duck faces, pig faces and monkey faces. Obelix had discovered the selfie. Asterix knew he was now a lost cause. Asterix resigned himself to his fate and went and slumped down at the cross road hand over his head. As he sat worrying, he heard a sigh next to him. He turned around to see a tall man in toga, a laurel wreath over his head. Caesar looked up hopefully. 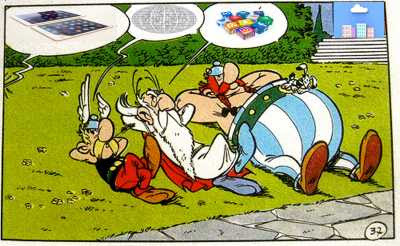 Asterix quickly laid out his plan. Caesar nodded, a smile on his face and jumped on to his horse. Asterix took out his last bit of magic potion, took a swig and they set out to wreak havoc pulling down the cables and towers of evil. Ha Ha! an out standing Satire! Good one...Keep blogging..with that little box!